In this 3+ hour workshop, we will explore the process of bringing a song to a full production. Along the way we will discuss the process of working with an artist/writer from the initial demo stage through to the final mix of a master recording. We will dissect a finished mix and show the various stages a production goes through. Comparisons with old school analog techniques and the state of the art digital world will help illuminate what remains important in production, and what has and hasn’t changed. 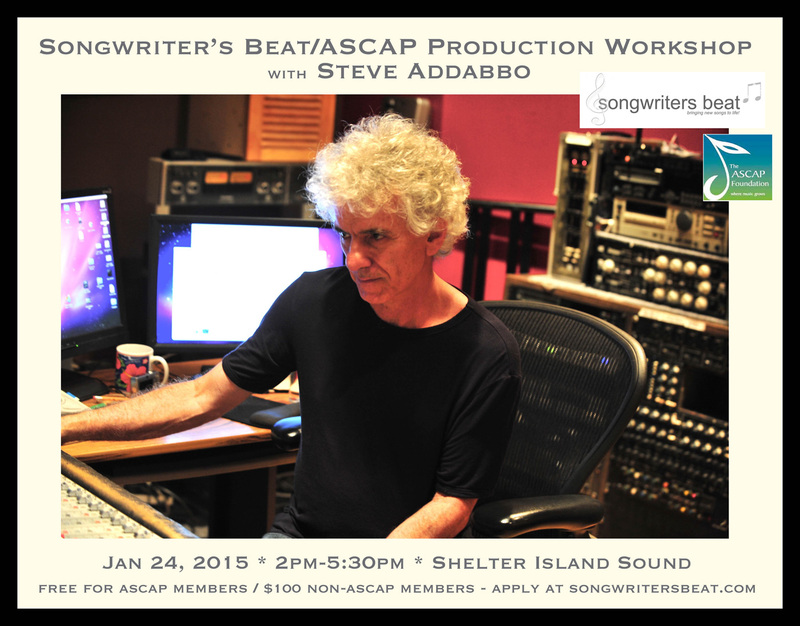 Workshop will be held in the control room of Shelter Island Sound (www.shelterislandsound.com). Questions are welcome! Steve Addabbo is a Grammy nominated producer, musician, writer, arranger, recording engineer and studio owner. Working his way up through the New York Studio scene Steve became chief engineer at The Hit Factory and then Sterling Sound before he formed his production company in 1984. Recent projects include mixing Bob Dylan’s Bootleg X, “Another Self Portrait”, unreleased recordings from 1970, recording Bobby McFerrin’s recent “SpiritYouAll” and an upcoming remix of a Staple Singers concert from 1965, commemorating the 50th anniversary of the freedom march from Selma to Montgomery, Alabama. Steve has served on the board of governors for the NY Chapter of NARAS, is an active member of ASCAP and a member of the Audio Engineering Society. Currently, he owns Shelter Island Sound studio in midtown Manhattan, which has been a vibrant part of the mixing and recording scene in New York for twenty five years.